Optical imaging techniques have come a long way since the invention of the first light-box, but a standard camera still only produces 2D images. To determine any 3D information, such as the distance to an object, Time-of-Flight (ToF) techniques are used. ToF systems measure distances by bouncing a laser pulse off an object, while timing the pulse’s journey, and building an image from the photons received at the detector. Most commercial ToF set-ups have found applications in autonomous vehicles and navigation systems, but have been limited to imaging reflective objects, and over a relatively short range. But Gerald Buller and his team from Edinburgh’s Heriot-Watt University, has designed a ToF system that can produce high-resolution (3D) images of everyday objects from almost a kilometre away, and with centimetre resolution. And because it uses a long-wavelength laser (λ = 1560 nm), the system can be used in daylight conditions, and is also eye-safe. Reported this week in Optics Express, the system works by sweeping a low-power infrared laser beam rapidly over an object. The round-trip flight time of the photons in the beam bouncing back to the detector is then recorded, and an image is built up from single photons, pixel-by-pixel. Other single-photon approaches can also provide exceptional depth resolution, but the key characteristic of Buller’s system is that, thanks to its nanowire-based detector, it can image non- reflective objects, such as clothing, vegetation, or rock surfaces. 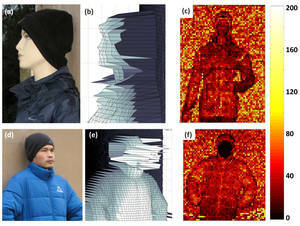 To demonstrate this, 3D images were taken of life sized-mannequins, and some members of the research team. Folds in clothing are clearly visible in the images, confirming that the system operates at centimetre (or potentially millimetre) resolution. But, one thing to note is that at these wavelengths, human skin does not reflect enough photons to obtain a depth measurement…. So this system can’t be used to recognise individuals! Outside of target identification, photon-counting depth imaging could be used for a number of other purposes, including the remote examination of the health and volume of vegetation and the movement of rock faces, to assess potential hazards. And it is expected that the range of this system could be extended to tens of kilometres within the next five years. Further work will also include reducing the size of system to make it more portable, and improving the acquisition speed. Currently, the entire process takes five to six minutes to complete, but the team have plans to reduce this to just under a minute.